Klay Thompson has done nothing but score buckets since he joined the NBA in 2011. With the Golden State Warriors on the rise and teammate Steph Curry one of the top stars in the NBA, Thompson gives the Warriors arguably the best backcourt in the league. Already popular with collectors, Klay Thompson rookie cards are beginning to push even higher. Shop for Klay Thompson cards on eBay. Klay Thompson was drafted 11th overall by the Warriors as a junior out of Washington State University. The former Cougar started his rookie season slowly, but after fellow shooting guard Monta Ellis was traded, Thompson received more consistent minutes and started to increase his production. He finished the second half of the 2011-12 season on a tear and was named to the NBA All-Rookie First Team. Thompson also finished a respectable sixth in Rookie of the Year voting. During the 2012-13 season, he combined with Curry to score the most 3-pointers by any duo in NBA history. Thompson has increased his scoring average in each of his first four years and made headline news thanks to his NBA-record 37 points in one quarter during the 2014-15 season. 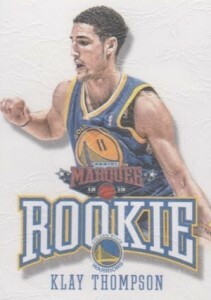 As a result of the lockout during the 2011-12 season, Klay Thompson's official rookie cards were not released until 2012-13 products. 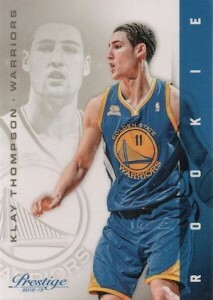 However, several 2011-12 Klay Thompson cards still sell for good values. Produced by Upper Deck, these are collegiate cards that are very respected among collectors, even if they're not NBA rookie cards. 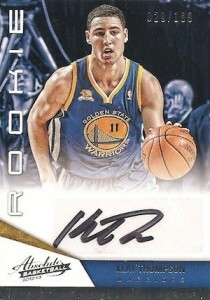 The 2011-12 Upper Deck Exquisite Collection Klay Thompson autograph is particularly popular among collectors. Although Damian Lillard, Kyrie Irving and Anthony Davis continue to be the main draws among the 2012-13 NBA products, Klay Thompson is closing the gap and this is helped by the Warriors surge to the top of the Western Conference. Collectors have nearly 30 different Klay Thompson rookie card options, including several autographs. National Treasures is his top overall signed rookie card, followed by Immaculate Collection. Thompson's Gold Standard autographed rookie is one of the best values for collectors. KLAY THOMPSON IMMACULATE COLLECTION ROOKIE 2012-13 PATCH AUTO GEM MINT!